If you’re suffering from missing teeth or ill-fitting dentures or other appliances, you understand the effect it can have on your daily life and confidence. It can be difficult to speak normally, to enjoy eating, and to smile comfortably. What you may not realize are the consequences lurking below the surface. Thankfully, your London dentist has the advanced training and technology to place and restore dental implants from the comfort of your dental home. Before we begin to discuss all of the wonderful benefits of dental implants, we think it’s important for you to understand what can happen when missing teeth are left untreated, and even with traditional restorations that sit on top of the gums. Surrounding teeth shift and rotate to fill the gap. Alignment changes can lead to bite problems and TMJ dysfunction. Without the support of the tooth root, the underlying jawbone deteriorates. Jawbone loss causes premature aging and sunken face appearance. With enough bone loss, you may no longer be a candidate for implants in the future. Confidence and quality of life suffer from missing teeth and ill-fitting restorations. Dental implants are the only way to replace a missing tooth root, rather than just replacing the crown or the portion above the gums. The tooth root is an essential component of a healthy, functioning smile. 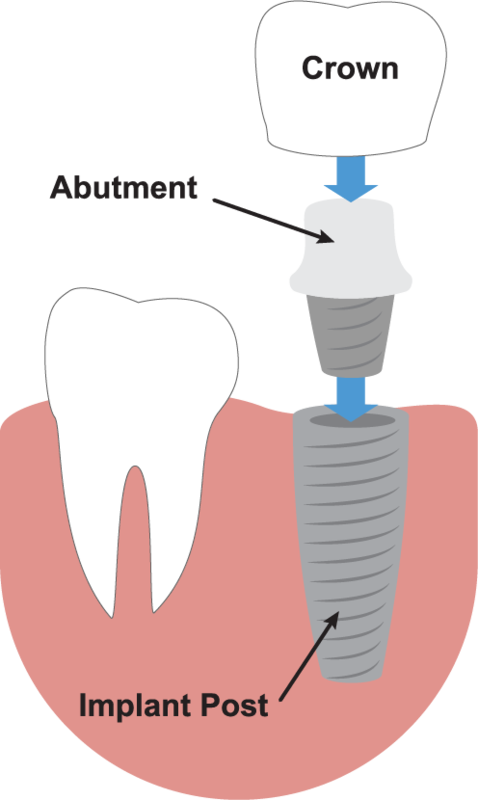 Dental implants are small titanium posts or screws that are surgically inserted into the gums and jawbone. Once healed, dental implants actually become fused to the jawbone, stimulating new bone and tissue growth around the implant. Dental implants are the only way to prevent all of the consequences of missing teeth mentioned above for the most life-like solution. After a healing period of a few weeks to a few months, we can replace a single tooth with a crown, multiple teeth with a bridge, or all your teeth with implant supported dentures. With over 30 years of extensive scientific and clinical research, Straumann® has improved lives all over the world with over 13 million implants in more than 70 countries. Dr. Spagnuolo is proud to place and restore Straumann® implants right here at We Smile Dentistry. Straumann® implants are engineered with Swiss quality and precision using leading-edge technology from biocompatible titanium or titanium/zirconium, with many options to fit your individual needs. With a 98.8% success rate, Straumann® implants are some of the most successful and longest lasting implants on the market. Can just four implants replace all of your top or bottom teeth? With All-on-4, the answer is a resounding YES! All-on-4 is a modern alternative to traditional dentures that gives patients a more secure, more natural solution to missing teeth. With All-on-4, we can even place implants and secure a full set of teeth the very same day! With All-on-4, we use the minimum number of implants (four) to support the maximum number of teeth (a full arch). With fewer implants than traditional implant supported dentures, All-on-4 is a more conservative, more affordable option that offers the same benefits and life-like qualities of implant supported dentures. With the utmost precision, the four implants are strategically placed to support the maximum number of teeth. The back implants are placed at an angle that allows them to support more teeth with fewer implants needed. Where traditional implants require a healing period before we can secure any teeth, with All-on-4, the implants and the “healing teeth” stabilize each other to encourage proper healing and integration, without having to live without teeth for weeks or months. If you’ve already suffered some bone loss from missing teeth, you may not be a candidate for standard implants. That doesn’t mean we don’t have other options for you! We are happy to offer mini implants that are smaller so they require less bone density to place, and they’re also a less expensive option for patients who may not be able to afford standard implants. If you have any questions about dental implants or would like to schedule a visit, please give us a call at (519) 661-0042 or get in touch with us online. Your London implant dentist, Dr. Giulio Spagnuolo and our team at We Smile Dentistry look forward to smiling with you! Serving smiles from London, St. Thomas, Lucan, Dorchester, Strathroy, and beyond!